On 8 May, Peter and Helen will start the next round of courses for beginners and intermediate (1 year of experience or more). In this course, we will repeat, refine and combine the basic elements. In this course, we will further explore the game of leading and following. To provide the pupils with more opportunity to practice, ask questions, and make more dancing hours, some practical lessons are also planned for these series, open to beginners and intermediates alike. The cost of this couse (consisting of 6 lessons of 1 hour and 3 practicals of 2 hours) is 75 euro per person; a single lesson costs 13 euro, a single practical 6 euro. Registration is done using the registration form. After registering, you will receive a confirmation containing the payment information. Following our terms and conditions , registrations for a full course take precedence over single lesson registrations, and are on a first-come, first-serve basis. The registration is only considered valid after the course fee has been received! Please indicate your name and the name of the course in the description. When registering for single lessons, the course fee can be paid in cash at the start of each lesson. Peter: In 2004 I first came into contact with Argentine Tango in the newly opened El Corazon in Aachen. It started with a weekend workshop and followed with numerous courses and workshop with various dancing instructors. In Daniel Perrusin I have found my instructor under whose teaching I want to further develop the elegant style of salon Tango. Helen: Tango is an important part of my life. 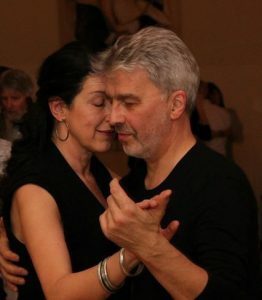 For me, Tango at its best is about living 100% in the moment, fully aware and relaxed, connecting with my partner and the music. I have learned a lot from various teachers in and outside of the country, and from my dancing partners. I love to pass on some of my passion for Tango Argentino to others.